Preserve sealing and labelling set. For 1lb pots. 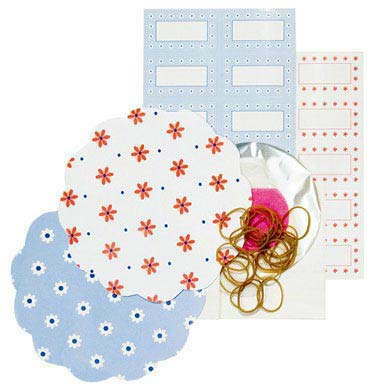 10 red and 10 blue patterned covers and labels, 20 transparent covers, 20 waxed circles and 20 rubber bands. Essential and decorative kit for sealing and labelling home-made preserves. Pot the jam / preserve and cover with waxed disc while the preserve is still piping hot. When jam is fairly cold this should be topped with damped cellophane disc and secured with elastic band. The cellophane shrinks when dry to create a tight seal over the jar.